Since I can remember, cruising through Franke Park for the annual Fantasy of Lights display has been our family tradition. It’s the perfect way to transition from Thanksgiving and the autumn season right into the chilly holiday winter just ahead. Our kids always look forward to the Fantasy of Lights, no matter how old—our thirteen year old daughter recalls back to when she was a little girl, and says, “Oooh, I remember that one!” And that’s what it’s all about during the holiday season—cherishing old memories and traditions while making new ones. The Fantasy of Lights is an impressive exhibit of lights, with over 75 unique and creative displays this year. From an illuminated Nativity Scene to an animated penguin display (our ten year old son’s favorite, and which also inspired him at three to become a penguin when he grows up…), families and children young and old will surely enjoy this festive holiday lights display. As you slowly cruise through Franke Park and take in the sights, tune your radio to a holiday music-filled accompaniment to really get the holiday mood going. We like to try and remember which displays are up next, and also see new ones. Invariably, the youngest falls asleep before it’s over, but the peaceful quiet helps us all enjoy the Fantasy of Lights a bit more! 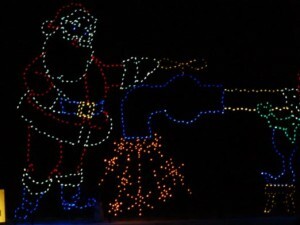 Don’t forget to bring the family for the annual Fantasy of Lights at Franke Park this holiday season! Open every night through Dec 31st, 2013 6 PM – 9 PM Sunday through Thursday 6 PM – 10 PM Friday and Saturday $5 per car; $10 per 15-passenger van; $25 per bus/trolley For additional information, please contact (260) 744-6145. Franke Park 3411 Sherman Blvd. To find out more about the Fantasy of Lights, or any of the other great holiday and HolidayFest activities going on around Fort Wayne, check out Visit Fort Wayne!